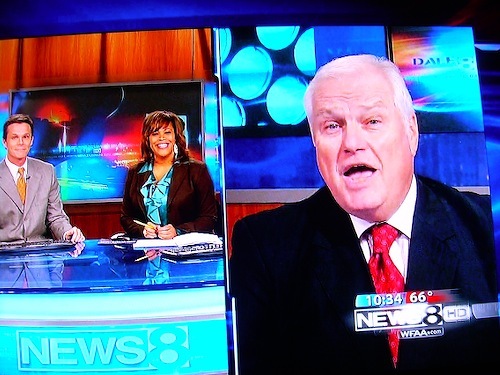 Loquacious WFAA8 sports anchor Dale Hansen invariably is good for a laugh or a cringe. He likely prompted both reactions Sunday night after news anchor Debbie Denmon congratulated him on winning a Lone Star Emmy Award for commentary at Saturday night's giveaway in Dallas. "I was pretty excited about it when you told me about that," Hansen replied. "But then I heard that Pete Delkus was also voted the best weathercaster, so how special can it really be?" Hansen won a statue for his periodic "Unplugged" commentaries. Among them were this year's nationally circulated ripping of WFAA8 management for airing a clandestinely recorded cell phone video of a seemingly inebriated Jerry Jones ragging on former Cowboys coach Bill Parcells at a bar. Delkus, who regularly spars and jokes with Hansen on the station's 6 and 10 p.m. newscasts, was honored along with CBS11 meteorologist Larry Mowry. Regardless of Delkus' inclusion, Hansen does have a point about the overall value of the Lone Star Emmys. Just shy of a gazillion are handed out each year at a ceremony that threatens to never end and perhaps still hasn't. For the record, though, WFAA8 won for "News Excellence" and Houston's KHOU-TV was feted for "Station Excellence." Both are owned by Dallas-based Belo Corp. Here's a complete list of the winners. *** During your friendly content provider's road trip, news came that the Texas Rangers have decided not to renew TV announcer Josh Lewin's contract after nine seasons in the booth with analyst Tom Grieve. Rangers president Nolan Ryan said in a pro forma news release that the two parties "have agreed to end their relationship and move ahead in different directions . . . We wish Josh the very best for the future." In a companion statement, Lewin thanked the Rangers "for nine wonderful years. I respect the team's leadership and vision and wish them nothing but the best as well." Grieve, a former Rangers player and general manager, signed a new three-year deal that will take him through the 2013 season. Most of the team's games are carried on Fox Sports Southwest, which set and then broke ratings records this season. The Rangers, Lewin and FSS are not commenting further at the moment. But the reasons behind Lewin's exit could be two-fold. "I think it's safe to say his style was rubbing some in the organization the wrong way," said a local sports broadcaster who regularly covers the Rangers. Lewin's style could be glib, depending on how good or bad the game was. And one wonders if old school Ryan got any of his Seinfeld or Caddyshack references. There also was the matter of Lewin's commitments to both the San Diego Chargers and the Fox broadcast network's Saturday afternoon baseball package. Combined, they regularly took him away from Rangers games during the closing one-third of the season. From the Rangers standpoint, you want a guy who's always going to be there -- and Lewin wasn't that guy. With new ownership now firmly in place, the impetus to make a change likely grew stronger. One of the Lewin-Grieve team's last interviews -- and it might well have been the very last -- was with unclebarky.com before a late August home game with the Minnesota Twins. You can read it here. ***Finally, here's something that's brilliant, dicey and incredibly daring. Fox4's spoof of itself as "The Social Media Station" at Saturday's Lone Star Emmy Awards ceremony in Dallas may have gone a bit far with its straight-faced sendup of a hostage situation at City Hall. But man, props anyway. Clarice Tinsley anchors, with social networking reports from the field by Matt Grubs, Sophia Reza, James Rose and Natalie Solis, who is caught in the act of taking "a picture of myself with one of the shooting victims" after promising to immediately post it on Facebook. Appropriately then, the three-minute video, which you really must see, is posted on my dumb little Facebook page. It makes Hansen's aforementioned "Unplugged" commentaries seem like passages from Winnie the Pooh. If you can't access my Facebook page, you can see the video here as well. And now that it's at last been posted on youtube, simply check it out below. Instant Classic.